Jane Kolowski, Assistant Manager at our travel agents in Lymington, spent 10 days in India, checking out some of the best hotels in which to stay when you visit cities such as Jaipur, Agra and Delhi. Here is what she got up to on her fascinating trip. It was a very welcome start to the trip when the Titan VIP Home Departure Service came to collect me in a luxury van (seating 5+ people). Less than two hours later it deposited me directly at Heathrow’s Terminal 3. After meeting up with nine other agents, two ladies from Titan (Sharon and Alana) and our Tour Manager Danielle, we checked in for our Virgin flight which was on a new Dreamliner. The flight was fairly quiet and after take-off we managed to spread out so we had at least two seats each for our overnight flight to Delhi. One main meal and one snack meal, as well as water or squash, were served through the night. The service of the Virgin cabin crew was attentive but not intrusive. We were met by our Tour Guide Rishi at Delhi Airport and taken by coach to our first hotel The Maidens Hotel in Delhi. It was a beautiful, classic colonial style hotel with fabulous bathrooms but the bedrooms had no natural light. The swimming pool was slightly tired looking and would benefit from being re-modelled to fit in with the rest of the property. The location was a little far out but my overall rating would still be 4/5. After a quick spruce up we headed into Old Delhi and took in the Raj Ghat (memorial to Mahatma Gandhi) and Jama Masjid, the largest mosque in India. India is a fascinating country with sights and smells to awaken your soul. The people are delightful and very friendly but extremely curious as well, following our every move. We then went straight on to Le Meridien in Delhi for dinner. There was a huge open atrium in the foyer but, otherwise, the space offered little character. However, the rooms were comfortable and there was even a large club room suspended above the atrium. In addition, there was an excellent choice of both western and Indian food on the buffet. My overall rating would be 4/5. We then headed back to the Maidens for an overnight stay. After breakfast, we were taken on a sightseeing tour of New Delhi, which included a drive past the President’s House and a visit to India Gate – a great memorial arch built to commemorate the slain heroes of WW1 and the Indo-Afghan War. Surprisingly, the locals were all wanting to take photos of our group (apparently it is unusual to see groups of western ladies). We then went on to visit the precursor to the Taj Mahal, HumaYun’s Tomb, which was beautifully peaceful and set in newly revitalised gardens. Lunch was followed by a quick tour of the Holiday Inn in Delhi (Mayur Vihar). This hotel has city views across the green belt. The rooms were comfortable but I felt the corridors were a little tatty. There was also an infinity pool but, as nothing was in place to prevent the pigeons from bathing there, they seemed to have taken over. My overall is rating 3/5. We then got back on the coach for a five-hour drive to Agra. On arrival, we checked in to the Radisson Blu in Agra for two nights.This is a modern hotel where the rooms and the beds were extremely comfortable and an excellent breakfast choice was offered. This hotel even had its own clairvoyant and puppeteer who were resident in the main lounge area! 4/5 is what I would give it. Again, after a quick wash and brush up, we went on to the Trident Hotel in Agra for dinner. It is an older-style hotel where the rooms are slightly dated and there was a limited choice of food at the buffet. It is an old favourite with Titan guests though and the staff were very obliging. My overall rating is 3/5, though. An early morning call at 4.30am prompted our excitement for the highlight of our trip, a sunrise visit to the world famous Taj Mahal. Built in 1560 by Shah Jahan in memory of his queen Mumtaz Mahal to enshrine her mortal remains, it took 20,000 craftsmen 17 years to complete this ‘Love Poem in Marble’. It was really everything I thought it would be and more and I found myself getting a bit emotional. As the sun rises and lights up the sky, it changes the appearance of this beautiful building which is a UNESCO World Heritage site. We then went on to visit the Agra Fort. Lunch was then taken at the Jaypee Palace in Agra with a hotel inspection thrown in. This large resort-type hotel has lead-in rooms which are of a good size and which feature balconies. However, there was a disappointing food choice at the buffet, with very little western food choices and the non-smoking rooms also smelt strongly of cigarette smoke. My overall rating would be 4/5. Afterwards, we travelled back to the Radisson for a bit of R and R around the pool, which was very welcome. In the evening, we visited the Four Point by Sheraton in Agra. Some of the rooms had Taj Mahal views and I loved the rooftop pool and spa. I was really disappointed with both the choices of food on the buffet and the position of the restaurant, which was in the open foyer of this hotel and made it an impersonal feel. This property was one of the few where I also found the staff indifferent. My overall rating would be 3/5. After breakfast, we left Agra behind for Jaipur, which was another five-hour drive. En route, we visited the deserted city of Fatehpur Sikri, which was built in 1569 and used as the capital city for 14 years until it slowly became deserted due to the scarcity of water. The buildings are beautifully preserved and have a haunting quietness that stays with you. Onwards to Udai Vilas Palace in Bharatpur for a spot of lunch and a quick inspection. I loved the colonial-style rooms with canopied beds as they all had plenty of character. A small pool is set in pretty gardens and the buffet choice was fair. There was a lovely atmosphere here and this led to me giving it an overall rating of 4/5. We continued on to Jaipur, arriving at the Hotel Trident, our home for the next two nights. This hotel is in a beautiful position; it’s right on the lake and very popular. The staff here were delightful, going above and beyond the call of duty. The swimming pool is enclosed but netted from the monkeys (always a good sign!) and the rooms were small but comfortable. Breakfast was served in our bedroom and was far superior to the buffet breakfast which was very limited choice-wise. My overall rating would be 3/5. Our evening meal was taken at the Holiday Inn in Jaipur. This is excellently positioned in the city centre and the rooms were beautiful. The Rooftop pool acted as a fabulous oasis of calm and a great contrast to the hustle and bustle of the city below. The food was great, with a huge amount of choice of both western and Indian food. It was, however, very busy here. My overall rating 5/5. After another early breakfast, we proceeded to the Amber Fort, a classic, romantic Rajasthani Fort Palace. Tourists have the chance to ride the elephants up to the fort and it is very atmospheric here, especially with the drums beating and the trumpets announcing the arrival of the elephants. 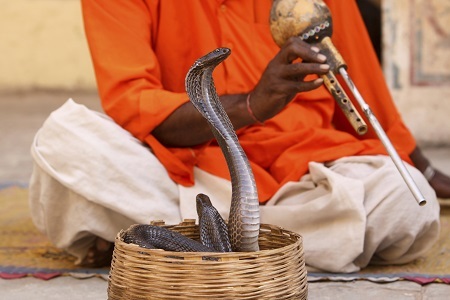 That’s without mentioning the snake charmers doing their thing. Tip them at your peril, though! We then travelled back into vibrant Jaipur to visit the Maharaja’s City Palace, but we were foiled by road closures as there was a festival celebrating Krishna. We had to travel by tuk-tuk and rickshaw to get there, which I can say was very scary but exhilarating. Lunch was then taken at a local restaurant which was delicious. In the afternoon, we visited a carpet factory/outlet for a little retail therapy and the evening meal was taken at the very beautiful Le Meridien on the outskirts of Jaipur. This resort hotel is fabulous, giving a great sense of space and we were made most welcome here with entertainment in the form of local dancers and musicians. The rooms were extremely spacious and both the western and Indian food choices were very good. My overall rating would have to be 5/5. After breakfast, we departed to Ranthambore by road. The coach that we were using was very new, the driver was a delight the busboy was continuously coming round with water, sweets and fruit. I certainly appreciated being driven as I would not like to drive in India. We arrived at the Hotel Ranthambore Regency for lunch and a two-night stay. It was a wonderfully relaxed hotel with attentive staff who weren’t overbearing. The rooms and bathrooms were quite tired and would certainly benefit from a refurbishment. The food was great and very tasty, although there was not as much choice as in a lot of the hotels. The pool area and gardens were lovely and the staff were very helpful. My overall rating would be 4/5. After lunch, we had a little relaxation time by the pool and then a wonderful evening meal here before retiring early for the excitement of the following day. 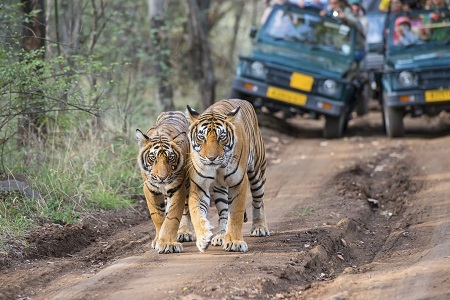 We had a very early start for our first game drive of the day in Ranthambore National Park, which is famous for its tigers. All of us were in a ‘canter’, which is a large open-topped vehicle. We saw sambar (a type of deer), monkeys, peacocks and vultures, as well as a rich variety of other birds but, unfortunately, no tigers (the best time of year to view them is Nov-Apr). We returned to a different part of the park in the evening and this time we travelled in two jeeps. This was a more comfortable option but also enabled us to climb steep hills for better viewing of the elusive tiger. Yet another early departure, this time to the railway station in Sawai Madhopur so we could board the Kota Janshatabdi express train for Delhi. It was a journey of nearly six hours but we were in 1st class (at a cost of just £6 each). The service was quite comfortable, with people coming round selling Chai (tea), curry (obviously) and a variety of snacks. On arrival back in Delhi, we were transferred to The Grand, where we would be staying for the last night. I found this last hotel stay a little disappointing for a 5*. The towels were old and smelt musty and the robes really needed replacing. The swimming pool, although lovely, was very quiet as it was extremely difficult to find. The breakfast buffet seemed to offer lots of choices but little to suit the western palate. The rooms and beds, however, were comfortable. My overall rating has to be 3/5, though. Our last hotel inspection and dinner at The Trident Gurgaon in Delhi was delightful and a great way to end our trip. The entrance and lobby are absolutely stunning and it deserves every one of its five stars. Although this hotel is 11 years old, it looks like it has just opened. The rooms were lovely, with either a garden or pool view and the swimming pool and outside areas were fabulous. It really did have the ‘wow’ factor, with dining in the main restaurant an extremely pleasurable experience. The only slight downside was the location of the hotel, which was a little outside the city itself. However, my overall rating is still 5/5. After the final breakfast, we were delivered to the airport at Delhi for our lunchtime flight home. This time, the flight was very busy, but again we were looked after very well by the Virgin cabin crew. I must say, after a nine-hour flight there is nothing better than being delivered home by a VIP transfer. I would like to thank Titan for an extremely enjoyable trip. They take the hassle out of tipping too by collecting in advance and sorting it all for you. Top tip! If you don’t smoke, it’s always worth request a non-smoking room in India as they can do both. 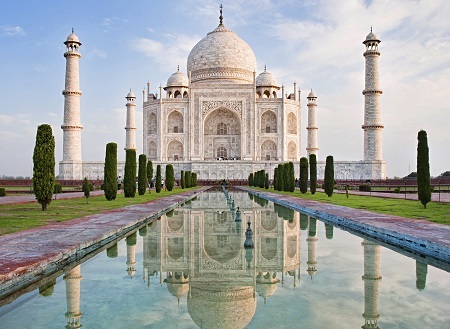 If you would like to follow in Jane’s footsteps and take a luxury holiday to India, we can help you find the best deal available. Drop into one of our travel stores along the south coast or in East Anglia and speak to a member of our knowledgeable team.